Sydney was once again transformed into a spectacular canvas of light, music and ideas when Vivid Light Festival Sydney started last week. Colouring the city with creativity and inspiration, the largest light, music and ideas festival in the Southern Hemisphere, Vivid Sydney features lighting installations around the Sydney harbour foreshore, live music performances, and over 120 creative industry events. 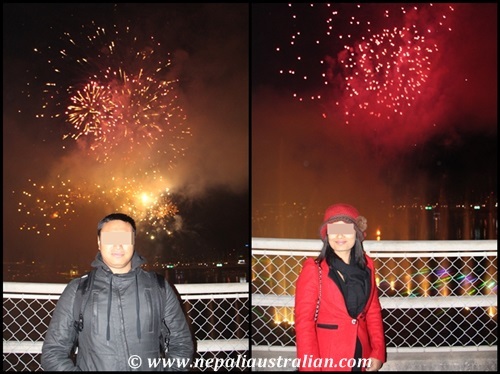 So on Saturday, hubby and me put on our warmest jumpers and went to the city to enjoy the colourful event. First stop was Darling Harbour and I have to admit Vivid is even better this year than the last few years. 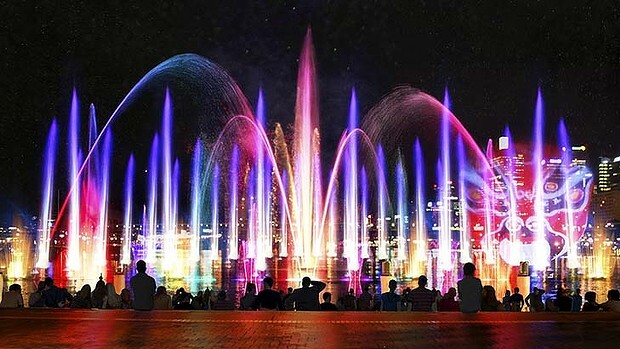 Vivid lights up the city like never before and creates an atmosphere of creativity and fun, transforming iconic buildings and spaces into canvases for light. This year, Vivid Light has tripled in size, with one-third of lighting installations from international artists including from the USA, Germany, Italy, Greece, Malaysia, Korea, Poland, Brazil and New Zealand. 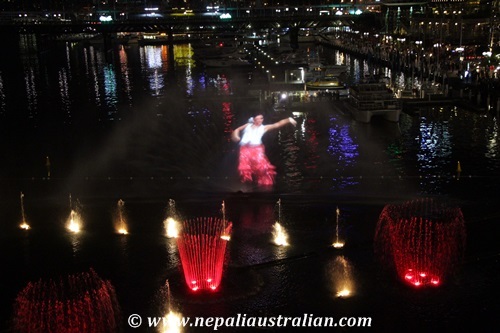 As we reached Darling Harbour, they had just started the 7pm show. As there were so many people, we were on the side and the view as not very good. Still, the 3D projections and laser sculptures were just amazing and it went for around 15 minutes. We wanted to see it again and someone told us that the show would be even better at 8pm with fireworks at 8.30pm. So we decided to hang around until 8pm and went to get the best place to watch, from the top of the bridge, next to IMAX. And we were glad we stayed. The 3D projection was different and much better than the 7pm. 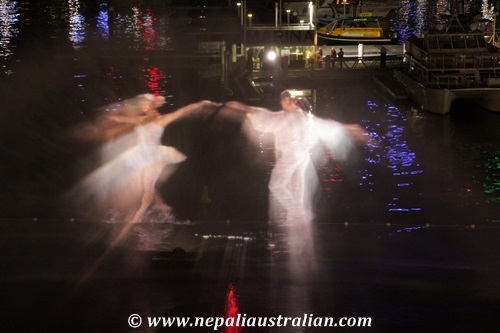 Aquatique Water Theatre transformed Cockle Bay into a 20-metre wall of water, light, colour, projections and music inspired by the fountains of Versailles. They had Spanish music, Bollywood music and ballet as well. That is not all, the water and display was just amazing. 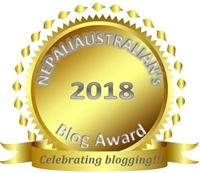 Watch the videos and photos below. The show lasted around 15 minutes. Then we waited another 15 minutes for the fireworks to start. Fireworks were amazing as well and they went on for around 10 minutes. Me and AS just enjoyed the wonderful view cuddling with each other. If you are a Citibank customer, you can also enjoy a pop-up bar on the Darling Harbour foreshore. 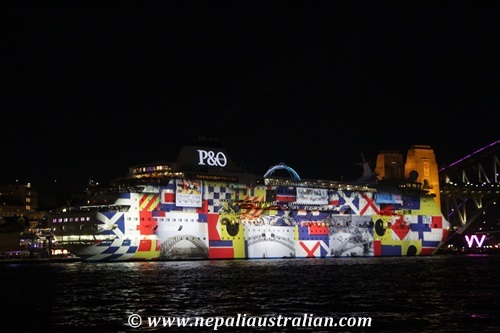 After the fireworks, we walk to the train station and went to Circular Quay where Opera House, International Passenger Terminal, a ship from P & O cruise and Harbour Bridge were lit up in bold colours and 3-D graphics. 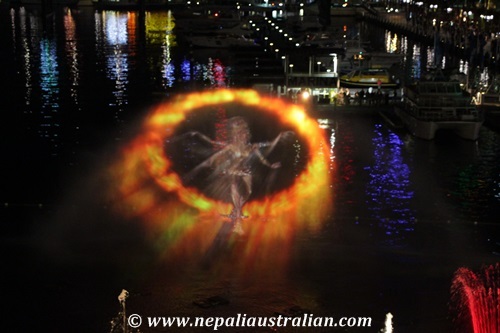 The grand façade of Customs House at Circular Quay displayed an amazing visual feast of 3D-mapped projections . 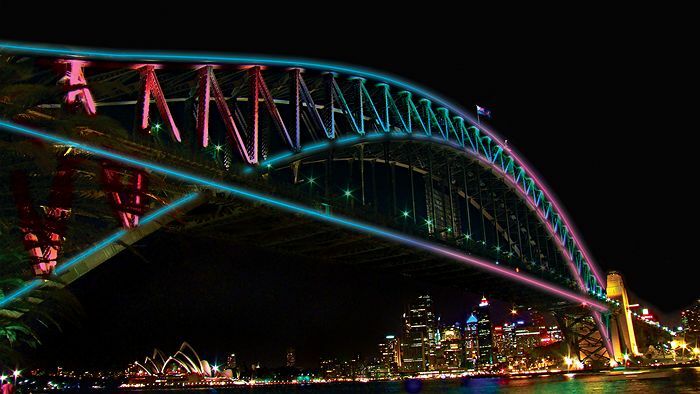 For the first time in the world also, the famed Harbour Bridge of Sydney comes fully alive through an “interactive lighting installation” found in the western side of the bridge. We were home around midnight and were glad to have had a great night out. If you live in Sydney, do go out and enjoy this awesome festival, and for everyone else here are some videos, I managed to capture and some from YouTube too. 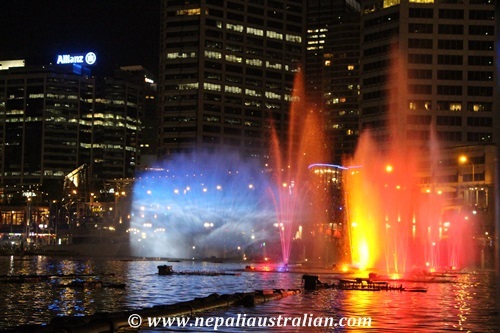 This entry was posted in Australia and tagged circular quay, Customs House, Darling Harbour, harbour bridge, International Passenger Terminal, light show in Sydney, opera house, Vivid, Vivid light festival, Vivid sydney 2013. Bookmark the permalink. Awesome photographs. Thank you for posting. 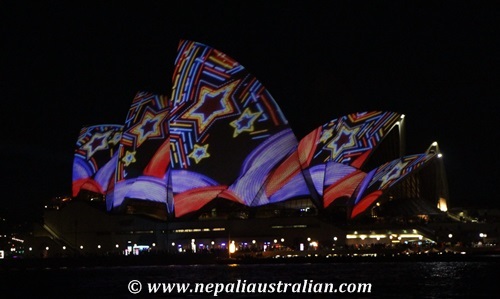 If I ever visit Australia my husband and I must ensure to come see this beautiful display of lights. That’s a display well worth seeing. Love it.